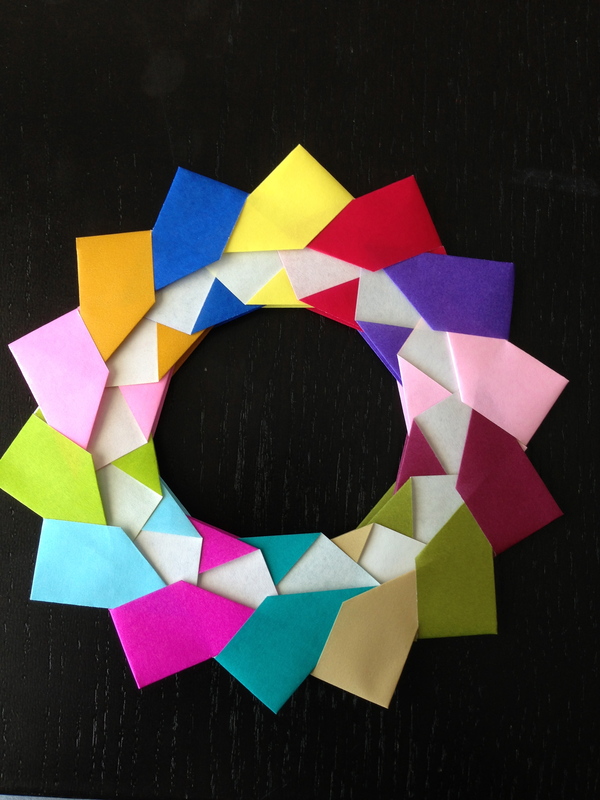 Have fun making this really cute Modular Wreath design, by Mette Pederson. Origami Paper (14) I used 3x3 paper. You can use whatever size you want the wreath to be. Some people also use Post-It notes! 5. Voilà! your finished wreath! Start with your paper color side down. Fold edge to edge to form a + in the paper. Fold the top left and the top right corners down to the middle. Like an airplane fold. Fold the bottom straight edge to the center. Unfold the last fold. Fold the bottom left and bottom right corners to the line you just made. Fold back with the crease that is there. Turn unit over, fold in half like a book fold. You should see the white of the paper when folded. Slide the blue piece under the green. Make sure the green is on both sides of the blue. Slide the green under the blue tab. This can be a bit tricky working on both sides. Continue with all the pieces. Some pieces like to slide around ... you can use a small dot of glue to hold them in place.